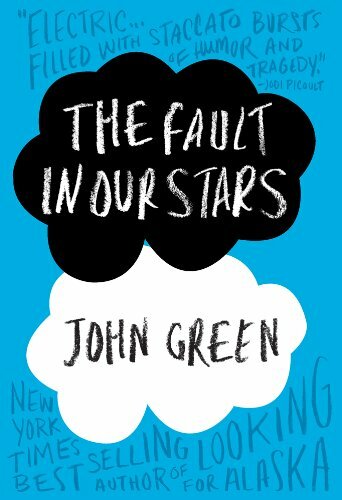 Like many others in the KidLitosphere, I preordered a copy of John Green's book, The Fault in Our Stars and through the magic of Amazon Prime, it's here! The funny thing for me is that I haven't been following the story of the book or the VlogBrothers, though I dip in on occasion. I happened to see that preorders were being signed and thought that would be cool and it was cheap on Amazon and mostly... well... I wanted to anticipate something. Lately the books that everyone's buzzing about are not what I love to read. Seriously, I gave away my signed Book Expo America ARC's of The Scorpio Races, Goliath, and Legend as prizes for the 48 Hour Book Challenge without reading a single one first. Which in retrospect seems very generous and a bit stupid. So yeah, I got The Fault in Our Stars mainly to capture some of that excitement of a long-awaited book. What have you been anticipating? I'm weird about that. I have so many books to get through I try not to look too far ahead into the future. And I don't always like every book from even favorite authors. So I prefer to wait until I've heard from some trusted sources before getting too excited. I hear a film review once say she was walking into a much-anticipated film with another well-known critic and she told him how excited she was. He said, "I prefer to be excited on my way out of the theater." I used to follow the vlog brothers pretty closely, less so now. I did pre-order a copy of The Fault in Our Stars after I read an excerpt and really enjoyed it. Plus I like all the other Green books so far; I figured this would be a good bet as well. I'm anticipating this one quite a bit myself. I don't have the joys of Amazon Prime so mine is still on the way. :) I'm still anticipating Winterling by Sarah Prinneas because it hasn't arrived yet (but should today or tomorrow). After that I will have to wait until March when Rebecca Barnhouse's Peaceweaver comes out (the book I am the most excited about this year). And my kids are very much anticipating The Duckling Gets a Cookie?! I regret the day I showed it to them on Amazon. They ask at least once a week if it is out yet. Only three more months of that. Yay. Oh, I hope you love it!!! I eagerly anticipating the day that my library gets it :) And I can't believe you gave away The Scorpio Races without reading it first! You are a kind, kind woman. I wrote a post on books I'm looking forward to reading in 2012, and the one by John Green was one of twelve. However, my book budget is hot, and Imay have to wait for a library copy. I preordered a copy and was still tempted last night (and tonight, since I am still waiting) to purchase it on my kindle so that I don't have to wait. I have a total author-crush on John Green. His writing is brilliant. Happy Reading- you clearly deserve to keep this one to yourself! I can wait for my copy as long as it takes me to finish Paper Towns and then read An Abundance of Katherines. If it's not here by then...I shudder to think. I'm loving the idea of a real Green bender. Although, not gonna lie, not expecting to love any of them as much as I did Looking For Alaska. I was anticipating Beautiful Chaos and Mastiff, but I've now read them. I want the next Sarah Addision Allen Novel and I'm looking foward to reading Kathy McCullough's Don't Expect Magic. Lupe interviewed her this week and now I really want the book. I read what John Greene's book was about and I think that it will be more of a Hilde or Lupe read than mine. I was looking forward to Adam Rex's Cold Cereal, but then I bullied someone into sending me an ARC. And then I heard Me and Earl and the Dying Girl was extremely funny so I figured out how to get a copy of that too! Now I am satisfied... for the moment! I'm also looking forward to this, as well as Bitterblue. And I haven't heard a date/time frame, but I'm anxious for the next Scarlett book by Maureen Johnson. I loved Paper Towns, just added my name to the queue for The Fault in Our Stars, I am 8th in line. I am curious to know how everyone learns about new books on the horizon. Certainly I understand if you are following the lists of specific houses or specific authors, but what other ways are there to "keep up" more globally? (I find that many books have already accumulated a significant buzz before I ever hear about them.) All suggestions appreciated. I preordered TFIOS because it seemed like a great thing to be part of - this whole community looking forward to the same book. (Truly, even though I have a huge crush on John Green, I haven't loved his books.) But now that I have it and have started it, I'm loving it! I too posted about my most anticipated kids books of 2012. I cannot wait for Virginia Wolf to be released! I made the mistake of reading the sample chapter of TFioS last month, then had to wait and wait for the rest to come out. If you haven't finished your copy yet, I'd recommend doing so in private. Wiping tears with coffee-shop napkins was a little embarrassing. Ed, I'm sorry I missed your question until today. I find out about most upcoming books from visiting other blogs. I also find out in the publishers' catalogs and when I go to a book conference like ALA or BEA. I am WAY behind on my reading, so I'm looking forward to reading our next two book club picks: BETWEEN SHADES of GRAY by Ruth Sepetys and CHIME by Franny Billingsley.